The winners of the 2018 Forsyth County Governor’s Volunteer Awards were announced Wednesday, April 25, 2018, during a breakfast for those nominated. 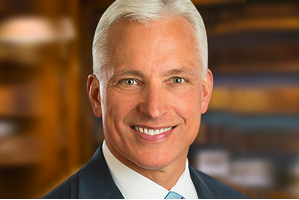 David Daggett (JD ’85), attorney and partner with the law firm Daggett Shuler in Winston-Salem, North Carolina, was proud to accept the 2018 Forsyth County Governor’s Volunteer Service Award in the People’s Choice category. North Carolina Gov. Roy Cooper has a large focus on and support for volunteers who make a difference. This is the 39th year that these awards have been awarded by the governor of the state of North Carolina. The awards recognize individuals, groups, and businesses who make significant contributions to their communities through volunteerism and community service. In Forsyth County the awards are managed by HandsOn Northwest North Carolina. Business owner, attorney, father, and Ironman competitor David Daggett was nominated by the Piedmont Down Syndrome Support Network (PDSSN) for this prestigious award. Daggett has worked with PDSSN for many years. This important nonprofit organization provides support and information to parents of children and adults with Down syndrome in the Piedmont Triad area. Daggett is known throughout the Triad as a leader in the community not only with his law firm Daggett Shuler, but as the co-founder of the long running Safe Sober Prom Night initiative. “Making a difference in the lives of our youth, and in the people who need us the most should be the most natural gift of giving. I urge everyone to get involved, pick a charity, an organization, and help make a difference,” Daggett said.